Click the button below to add the Organic Wool/ Silk Men's Midweight Leggings to your wish list. These organic wool/silk men's leggings with a fabric weight of 200 g/m2 make an excellent base layer and can also be worn as a mid layer (second layer) over lighter weight items, depending on the temperature and degree of warmth desired. These leggings are ideal for running or any other active, outdoor sport. This fabric is more robust and substantial than Engel's lighter weight garments, so these garments offer more room for air pockets that provide thermal insulation. The fine, soft blend of merino wool and silk protects you from feeling cold and from overheating, insulating against temperature extremes regardless of the weather conditions. This garment is machine washable (see details below). Made by Engel Sports, these leggings are a high quality blend of 70% organic Merino virgin wool, 28% silk, and 2% spandex. The merino sheep that produce the wool are certified organic livestock from South America. 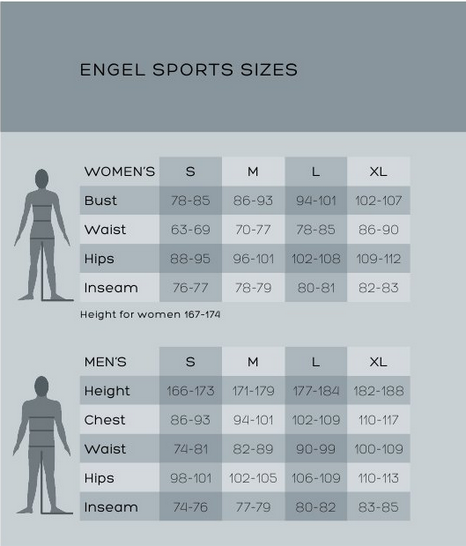 All Engel Sports garments are produced in Germany in compliance with the criteria for socially responsible labor practices and certified under the Global Organic Textile Standard (GOTS).